Schubert's Serenade (Ständchen) from Schwanengesang, D.957 has been arranged for viola solo and piano by the world-famous violist Donald McInnes, who held a professorship at the University of Southern California from 1985 to 2014 and is known in virtually every corner of the artistic world for his appearances with major orchestras, recitals, chamber music participation, and numerous master classes. Schubert's immortal Serenade was written in 1826. It is one of the most beautiful and simple melodies ever written and it was originally composed as an alto solo and a chorus for male voices, but was afterwards re-arranged for female voices only. One Sunday, during the summer of 1826, Schubert with several of his companions was returning from Potzleinsdorf to the city, and on strolling on the way through Wahring, where he saw his old friend Tieze quietly napping at a table in the garden 'Zum Biersack.' A few moments later the whole party were seated and then followed a clinking of glasses and a drinking of beer. Tieze had a book lying open before him, and amid the general jollity and conversation, Schubert began to turn over the leaves. Suddenly he stopped, and raising from his chair, with his finger pointing to a well-known poem of Franz Grillparzer, he exclaimed: “Oh, such a beautiful melody as has just now crept into my head! If I only had a sheet of music-paper!” One of the party came to his assistance and drew a few music lines on the back of a bill of fare. Schubert then, while a real German hubbub was going on all around him wrote down that most beautiful melody. 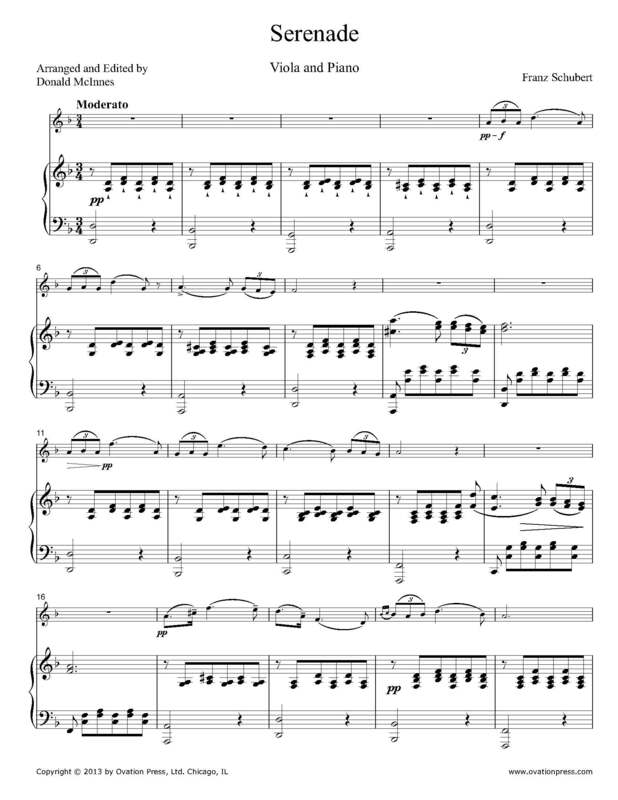 Download and print the score today to gain access to this expertly edited arrangement of Schubert's Serenade (Ständchen) from Schwanengesang for viola and piano by Donald McInnes!